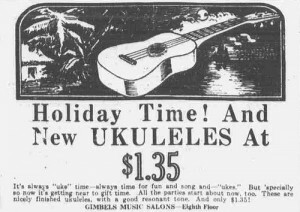 Everybody thinks that the ukulele came from Hawaii. Well, while it’s true that the word ukulele is a Hawaiian word (it means, “Jumping flea”), the uke actually has Portuguese origin, taking its characteristics from the cavaquinho and the rajao. It is said that Portuguese immigrants brought the ukulele to the islands in the late 1800’s and that the instrument’s portability and ease of play made it the instrument of choice in tiny Pacific villages. While Shimabukuro is the most famous virtuoso of the instrument, more recently, artists such as Eddie Vedder of Pearl Jam and the adult contemporary group, Train, have integrated ukulele into their songwriting and performances. It’s unique sound has mass appeal and is distinctive and pleasing to the ear, making it a nice addition to any rock group. Currently, the uke’s versatility can be heard in mainstream pop, rock, bluegrass, folk, country, jazz and more. It has been played as both a lead instrument and for rhythm in all types of music. Its popularity is rising at a mercurial rate, which makes it the perfect instrument to learn right now. A four-stringed instrument, the ukulele is simple to learn. Like guitar, once you learn a few chords– and the correct way to strum– you can play hundreds of songs. Many who find learning the guitar too daunting will find the ukulele to be a nice alternative. It may also be the perfect instrument for the novice who has visions of being a guitarist someday as it introduces the player to the family of stringed instruments. The ukulele’s small size and diminutive appearance shouldn’t be taken for granted. Out of these incredible instruments can come incredible sound. Its portable enough to take anywhere and its mere presence at camp outs, cook outs, jam sessions, beach blanket bingos and company picnics will have everyone gathered around admiring your musical artistry. You don’t have to be Hawaiian to enjoy the sounds of the ukulele and you don’t have to be a master of music to sit down and play one. Pick one up, give it a strum and you’ll see how easy it can be to make music. This pack includes everything you need to play ukulele today! The high-quality uke is ready to pull out and play. It’s finely constructed with quality tuners and level playing bridge making it an ideal instrument to learn on. The pack also includes a comprehensive and easy-to-use beginner’s book authored by uke master Lil’ Rev. It includes many songs to play while you learn and includes a CD with 46 demo and play-along tracks. In addition, the book includes information on tuning, reading music, melody playing, strumming, scales, and a handy guide showing more than 1000 ukulele chords! The DVD features on-screen musical examples and demonstrations to really hammer home everything you’re learning in the book. Whether you’re teaching yourself or a classroom of students, this pack will get the job done! Grosse Pointe Music Academy offers private ukulele lessons and classes. Tuesday August 23rd was just the Uke’s Birthday. On August 23rd in 1879, the Ravenscrag docked in Hawaii. On board were Joao Fernandes and three carpenters: Manual Nunes, Augusto Dias and Jose do Espirito Santo. That day, Fernandes played a tune on a thing known as a braguinha, a machete or a rajão. Soon, the three carpenters adapted these guitars and by the late 1880s, people started calling the new instruments by a new name: The Ukulele. The Ukulele is awesome. I play mine every day! It’s a fun instrument to take with you wherever you go. I highly recommend learning.